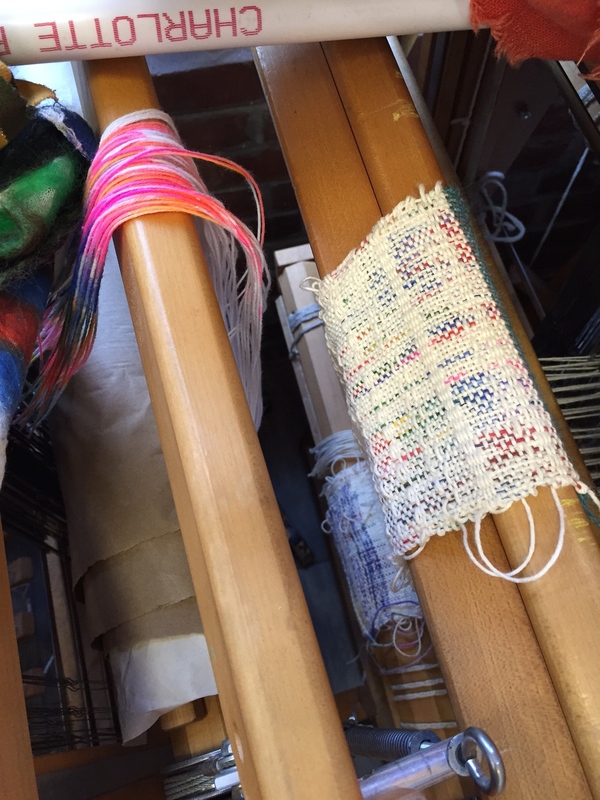 News from New York: Weaving is Hot! In the heart of hip Brooklyn, Erin Riley talked incredulously about how popular weaving has become, the type of weaving that she characterizes as “chunky stuff with fringe.” It’s sold at fairs and on Etsy. “People are losing their minds over this,” she said. “They are swooning. It’s everywhere.” People are flocking to frame loom classes and weaving pieces with many types of yarns, like the types that people used to buy at estate sales under the realm of hand-made. Maryanne Moodie, an artist from Australia, transplanted to Brooklyn, is characteristic of the new type of popular weaving; see her Instagram site. 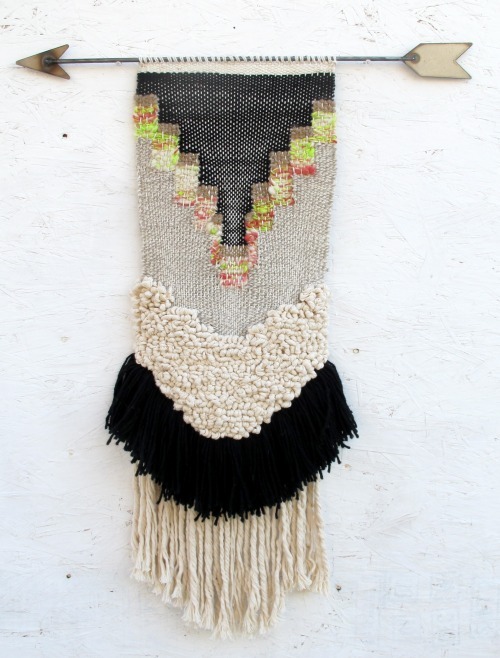 Janelle Pietrzak is another artist weaving in this style. Artists who haven’t focused on fiber in the past are incorporating weaving into their practices. Brent Wadden started by weaving simple triangles; his large geometric pieces incorporating weaving are now sold at prestigious galleries. The Textile Art Center in NYC has two locations, a smaller space in Soho and a larger space with lots of floor looms in Brooklyn. I visited the Soho location after my trip to Brooklyn and spoke with a teacher named Joey, who told me about his after-school program. Currently he has three students, a five-year-old-girl and two seven-year-old girls. One project underway is weaving. My photo only shows the folded-up looms, but you can see the painted warp draping on one loom and a weaving underway on another. They love the floor looms, Joey told me. They love to have the power of using a machine and use the pedals. 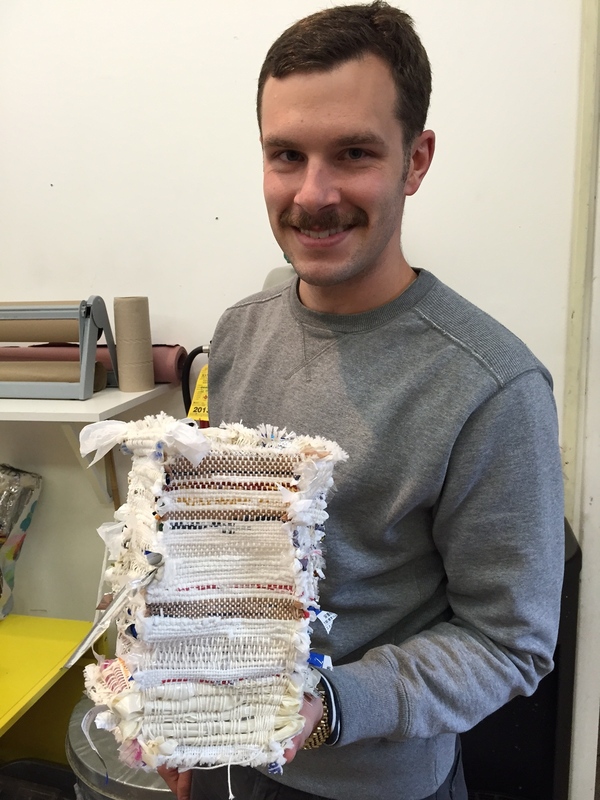 The last kids weaving project was creating a five-sided refuse basket made with plastic bag strips. Weaving isn’t the only textile technique in vogue. 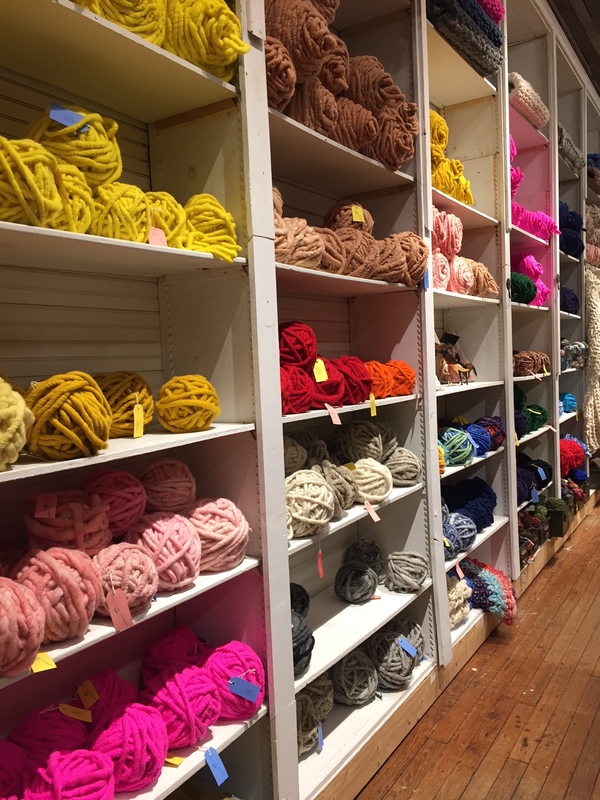 I visited Purl Soho; amazing numbers of people were buying very expensive knitting yarns. Joey recommended visiting another nearby shop, Loopy Mango (named after the owners’ dog and cat). It was a combination of yarn shop and antique/curiosity shop. The specialty was very thick yarn. 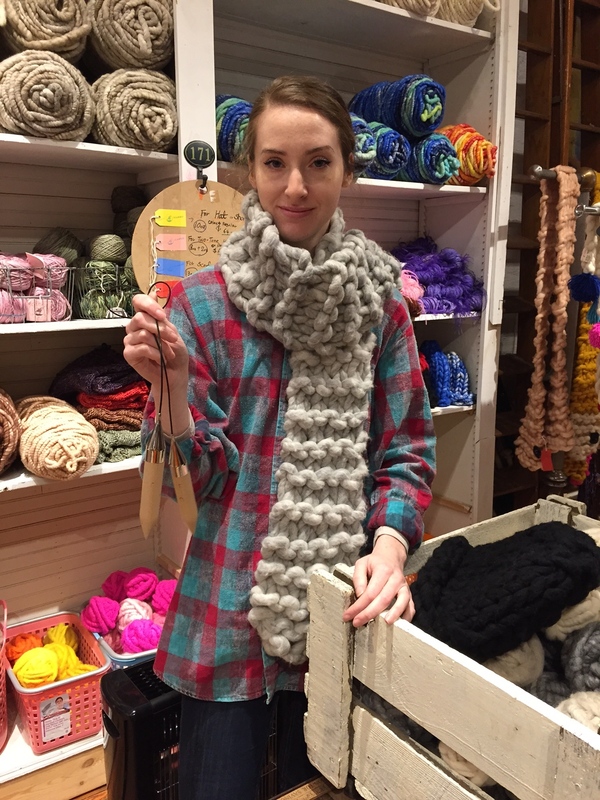 The yarn to make a long scarf costs $78.00, and I didn’t check on the price of the size 50(!) needles. I’m having a great trip to NYC, but all this makes me want to get home to my loom. I’m headed to NYC the week of February 8th. Any recommendations on what I have to see/do weaving wise???? Hi Carmen, now that I’ve finished my NYC week of blog posts, you have my suggestions! Also, be sure to visit the tapestries at the Cloisters. I visited them on a previous trip, so it wasn’t included this time. Have a great time!